No matter how big is the size of your company, it is always significant and beneficial to ensure that the time and resources you dedicate for activities pertaining to build investor relations are into adequate and effortless use. You can minimize the time spent on administering your investor relations program. How does Research Bytes help as an Investor Connect Platform? Research Bytes is an Investor Relations Platform where, over 5000 FII Fund Managers, DII Fund Managers, PMS Managers, Buy Side Analysts, Sell Side Analysts, Credit Analysts, and Bankers from more than 600 Research Houses. In addition to this, over 3000 serious investors use this platform for their Investment related information. Explaining more about RB, we cannot forget mentioning that Research Bytes is the world’s only platform to connect companies with investors. This is one rostrum, which facilitates a smooth exchange of information between corporate enterprises and financial analysts. This exchange helps the investors keep themselves in line with the latest corporate events, like analysts meet, conference calls, quarterly & annual results meet, and company announcements. How else does RB help the investors? This Investors Relation Platform also provides the analysts with the Companies Quarterly and Annual Reports, Investor presentations, audio and text transcripts, and management interviews. All this, thereby help the investors make wise and well-informed decisions. This is a concept to highlight the companies’ performance to the Investors. When any company is on a Road show, the investors will have an easy access, and their commitment to the Investor Relations would be much high. Many a times, RB would by itself make a choice for the companies that are transparent and investor-friendly, to exhibit their performance. Along with all this, the Road show will serve the larger purpose of getting the specific queries answered, and/or even arranging conferences/meetings with such companies. 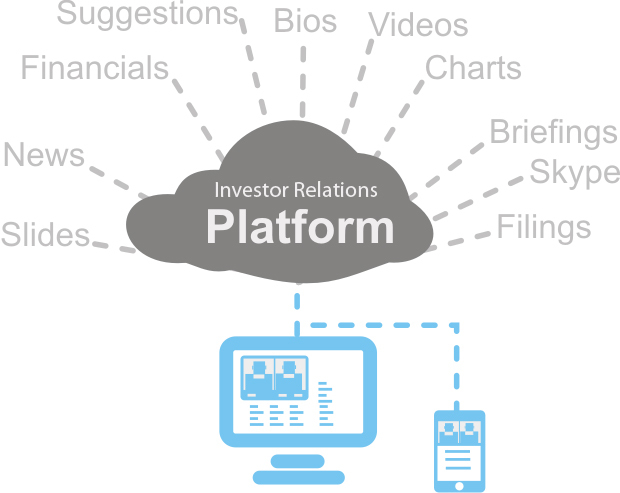 All the Investor Relations Companies, who use the platform of RB, are able to communicate and exchange information with the largest audience of Top Investment Professionals, extensively using Research Bytes Platform. Research Bytes is an attempt to increase the overall transparency in the corporate arena, by bridging the gap between the enterprises and Analysts Community, under a common roof. RB achieves this via effective sharing and distribution of useful information across the investor community. Moreover, RB is an initiative taken to provide a platform, also for the small and mid-sized companies, so that they can reach out to a broader range of Institutional Investors Group. RB is that structure that helps big corporate houses develops their relationships with investors via online association. This collaboration assists the Investor-Enterprise relations channelize their efforts towards a richer growth and better productivity. Overall, RB is the one-stop destination for all your Research Needs whether it is Latest Quarterly results of Indian Companies, or annual reports and balance sheets of listed companies. You just search it, and your personal research associate – RB has it. Pingback: How Do You Analyze The Performance Of A Listed Indian Company?